yossman.net is a computer consulting and internet services group with offices in south-western and eastern ontario, in canada. we create custom business internet / intranet database and network automation solutions, designed for reliability and longevity, and provide training for general computer literacy improvement. we also specialize in diverting technology considered "obsolete" from garbage landfill sites; through our computer equipment repair, refurbish, recycle and re-purpose programs, we increase our clients' return on investments to their systems by extending the life of hardware and software that can still serve useful functions, while reducing loads on public dump sites. [ wanttoknow.info ] - verifiable/reliable information on major world events. [ truthout.org ] - environmental and political articles, forums - insights into our civilization. [ yesmagazine.org ] - yes! magazine - articles for positive change in our world. [ thecorporation.com ] - documentary: detailing major corporate abuses of people and the earth. [ thepeoplesvoice.org ] - environmental, political, and social justice news and links. [ ranprieur.com ] - ran prieur's thoughts and essays on civilization and lifestyle choices. [ affluenza.org ] - an unsustainable addiction to economic growth. [ wikileaks.org ] - distribution hub for whistle-blowers around the world. [ localharvest.org ] - farmer's markets directory, natural/organic food info, community supported agriculture (CSA). [ endocrinedisruption.com ] - toxic pollutants in the environment affecting human genetic health worldwide. [ ecocycle.org ] - working to build zero waste communities (boulder, colorado, USA). [ desmogblog.com ] - clearing the pollution clouding climate science - what our leaders aren't doing. [ endofsuburbia.com ] - documentary: the end of the cheap oil age and suburban sprawl has begun. [ odac-info.org ] - penser bio, nature et environnment (french language). [ ilsr.org ] - institute for self-reliance - practical news about reversing global warming. [ oildepletionprotocol.org ] - Oil Depletion Protocol - plans for a sensible energy future. [ richardheinberg.com ] - Richard Heinberg and humanity's prospects and the oil depletion protocol (museletter.com). [ zerofootprint.net ] - software development for companies to reduce business/employee environmental impacts. [ resilience.org ] - suports building community resilience in a world of energy and environmental challenges. [ endtimesreport.com ] - a guide to self-reliant living - covering some basics. [ cat.org.uk ] - centre for alternative technology - 30+ years of finding another way. [ postcarbon.org ] - learning to adapt to an energy constrained world. [ realclimate.org ] - climate science findings and discussions, direct from climate scientists. [ communitysolution.org ] - when petroleum / oil becomes scarce, the solution is in the community. [ wtrg.com ] WTRG Economics - oil and gas forecasts and stock data with graphs. [ hubbertpeak.com ] Hubbert Peak of Oil Production - where the term 'Peak Oil' originated. [ journeytoforever.org ] - energy, heating, and communications in third-world countries, by Handmade Projects. [ planetfriendly.net ] - peace, the environment, and employment opportunities (GoodWork Canada). [ transformationteam.net ] - ever had the feeling a main reason you're here is to help transform our civilization? The Global Green Movement: strategizing to help change common government policy; moving towards more sustainable living, egalitarian society, and helping to reverse the poisoning of our environment. [ commondreams.org ] - current news items and articles from many progressive thinkers. [ globalresearch.ca ] - centre for research on globalization. [ gregpalast.com ] - greg palast - american political investigative reporting. [ thenation.com ] - the nation - a US political magazine, recognized and respected internationally. [ counterpunch.org - a very informative, alternative political magazine. [ alternet.org ] - alternet news network. [ democracynow.org ] - TV/radio news, community media collaboration, by Amy Goodman and Juan Gonzalez. [ adbusters.org ] - adbusters magazine: showing up "corporate culture" for what it is. [ consensus911.org ] - consensus 911, in search of truth about the 9/11 WTC attacks. [ ae911truth.org ] - architects and engineers for 9/11 truth. [ freedomtofascism.com ] - Aaron Russo's America: Freedom to Fascism, a political documentary. [ communitycurrency.org ] - the difference between money and real wealth. [ factcheck.org ] - double-checking U.S. political claims for spin factor. [ unitedforpeace.org ] - united for peace and justice. [ indymedia.org ] - independent media center - non-corporate collective of media organizations. [ reclaimdemocracy.org ] - restoring citizen authority over corporations - resisting 'corporate personhood'. [ multinationalmonitor.org ] - monitoring corporate activity, especially related to third-world development. [ retrovsmetro.org ] - do you believe in tomorrow? [ responsibleshopper.org ] - do you know what your shopping supports elsewhere? [ coopamerica.org ] - use your consumer dollars to help bring about societal change. [ fromthewilderness.com ] - insight into future politics and energy crisis [ secondary site ]. [ FreeBSD (freebsd.org) ] - a free, open-source unix operating system. [ Apache Software Foundation (apache.org) ] - for making some of the best web server software in the world. [ OpenBSD (openbsd.org) ] - an alternative free, open-source unix operating system. [ Citizens For Renewable Energy ] - C.F.R.E. based in lion's head, ontario, canada. [ Electronic Frontier Foundation (eff.org) ] - for individual's rights online. [ PetitionOnline.com ] - online petitions for any cause; free setup and maintenance for anyone. [ Spybot - Search and Destroy ] - find and terminate spyware on windows systems. [ SAMBA (samba.org) ] - allowing unix to speak windows networking. [ Green Party of Ontario ] - ontario provincial political party affiliated with the Global Greens international movement. yossman.net also provides discount internet website and email hosting where possible to artists, musicians, and other low-profit organizations that do not have a budget for such services. [ letters to public organizations ] - open letters from yossman to agencies who have requested public comment. "Measure Gross National Happiness - National economic product is not a good proxy for progress. Look to factors like psychological well-being, community vitality and environmental quality." "Progress for Whom? The expansion of capital demands sacrifices. But those who make the sacrifices and those who progress are not the same set of people. 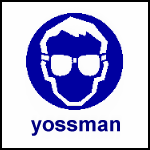 yossman.net - helping people use the Internet since 1996.
copyright © 2018 yossarian holmberg of yossman.net, in canada. this page last revised on 2018-05-28.